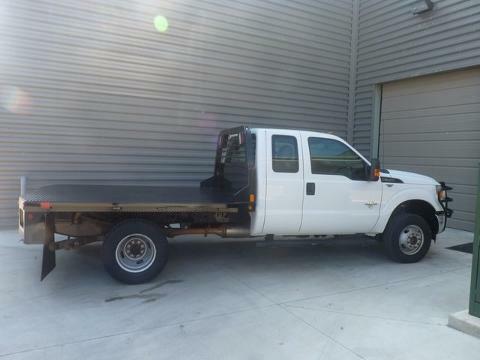 ONE OWNER xxxx FORD F 350 SUPER CAB SUPER DUTY XL DRW WITH NEW FLAT BED, BALCK RANCH HAND BUMPER, BLACK STEPS, TRAILER BRAKE, FACTORY UPFITTER SWITCHES, VINYL SEATS, POWER WINDOWS, POWER LOCKS, CRUISE, SYNC. CALL OR STOP BY FOR A TEST DRIVE!! !---- IF WE DON'T SERVE YOU, WE DON'T DESERVE YOU! Seminole Ford proudly serving the following communities Seminole, Shawnee, Prague, Tecumseh, Wewoka, Holdenville, Wetumka, Ada, Norman, Stroud, Okemah & Meeker.